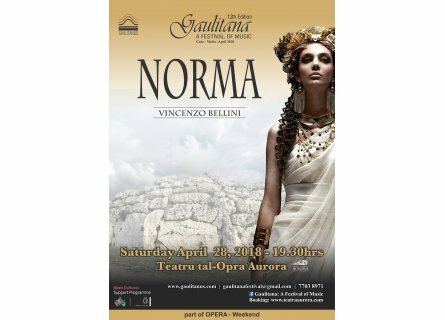 Bellini’s opera Norma, the beautiful operatic masterpiece featuring a tragic love triangle in Roman-occupied Gaul over 2,000 years ago – and one of the most challenging roles ever written for a soprano – will be the highlight of the 12th edition of Gaulitana: A Festival of Music. ON SATURDAY APRIL 28TH 2018. Enrico Castiglione will return to direct this bel canto masterpiece, with costumes designed by Sonia Cammarata. Colin Attard will conduct the Malta Philharmonic Orchestra and the Gaulitanus Choir.